Teaming up with ‘Demis Roussos’! A Demis Roussos impersonation was part of the entertainment when Jimmy Cricket joined up with fellow comedian Alfie Joey. The Jimmy & Alfie Show took place at the Customs House Theatre in South Shields last month. Alfie has a real Tyneside connection as not only was he born in the region, he is also the current presenter of BBC Radio Newcastle’s breakfast show. The show was well-received and Alfie even did an impersonation of Artemios ‘Demis’ Ventouris Roussos, a Greek singer who had a string of international hit records as a solo performer in the 1970s. His most famous single was Forever And Ever which topped the charts in several countries. Jimmy said: “I was happy to spend some time after the show meeting and greeting those who were in attendance and was thrilled to have a chat with Susan Barnes.” (pictured above right). Green cake with wellies on it! 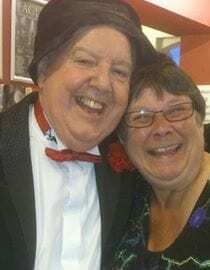 Jimmy Cricket was presented with an Irish-themed cake when he returned to perform at the Billingham Forum Theatre near Middlesbrough. The famous Belfast-born entertainer appeared in Snow White and the Seven Dwarfs at the North East theatre over the Christmas and New Year period. Sellout crowds watched the pantomime; in fact, the biggest attendances ever for a panto at the venue. And as he arrived to perform again at the theatre at the start of April, he was greeted with a green cake with a pair of wellingtons on it – Jimmy is renowned in his acts for wearing wellies on the wrong feet! The cake was made by Stockton resident Yasmin Calvert whose mum, Janet, went to the stage door of the theatre to hand it to Jimmy. Jimmy said: “I was overjoyed on receiving it as it’s one of the best that anyone has made for me. I was particularly impressed with the detail of the decoration and amazed at how it was produced all in green! His comedy show was a triumph as almost 400 people came to see Jimmy on his return.